The “Reigning” Icon of the Mother of God revealed itself to the Russian Orthodox people on 2/15 March 1917, exactly eighty years ago, in the village of the Kolomna, near Moscow. Now concerning the revelation of the icon (also spelled ikon) of the “Reigning” Mother of God. This account was according to personal reflection of Professor Ivan M. Andreyev. “Soon after the tragic abdication of the Throne by Tsar Emperor Nicholas Alexandrovich, which took place on March 2, 1917, throughout Russia extended the news, that namely on this day, in the village of Kolomskoye in the vicinity of Moscow (at 6 versts from the Daniel entrance) there took place the miraculous revelation of a new icon of the Virgin Mother of God, called the “Reigning One”, for the reason that the Queen of Heaven was depicted on this icon as the earthly Queen. 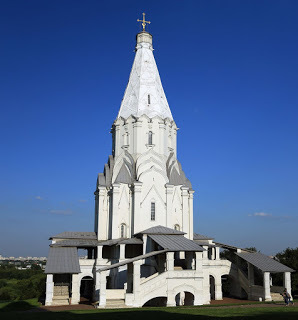 Shaken by the news, at the beginning of the summer of 1917, I decided to go to Moscow attempt to make my way into the village of Kolomskoye in order to pay homage before the newly revealed icon and personally ascertain the circumstances of its revelation. The Lord helped me to realize my intention, although at the time pilgrimages of the type were extremely difficult to carry out. One good friend of mine, servant of God Mary (a collaborator at the University of Moscow, a big specialist on ancient Russian iconography), having constantly resided in Moscow and already having succeeded in visiting the village of Kolomskoye, – she undertook to help me, and together with her we proceeded with our journey. We went from Moscow to the village of Kolosmkoye village Ascension Church, Father Nicholas (the parish priest). He me us friendly and warmly, gave us food, showed us numerous icons in his home and related the following: One elderly, pious woman, a peasant of Borovichy main district, Ziroshkino local district, village of Pochinok, Evdokia Andrianova, having lived in the village of Pererva during the month of February in the year 1917, thrice in a dream saw the most Pure Mother of God and heard Her voice, telling her to depart into the village of Kolomskoye, where in a church, amidst furniture, abandoned utensils and dust, was to be found a large old black icon. 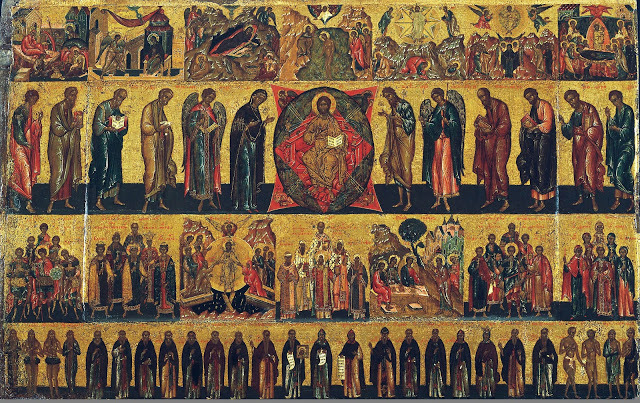 It was the icon of the Heavenly Queen commanded to be found, and incidentally, she said that from the “black one” it would be transformed into a “red one”. 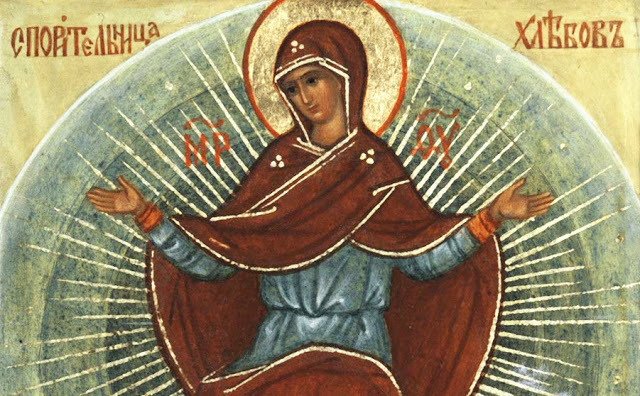 The apparition was unclear, she was unable to recall the details of the icon on awakening, but the general impression of an especial quality of the Reigning grandeur of the Mother of God depicted on the icon – this remained in her consciousness. Father Nicholas recounted how he did not immediately believe Evdokia Andrianova, and was even inclined to judge her for her having had faith in dreams: however, three repetitions of the dream, the meekness of the pious woman, and likewise the indications, that the icon was “large”, “black”, and remains amidst old furniture and dust somewhere in the church namely of the village of Kolomskoye – compelled him to go together with Evdokia Andrianova to the church, and to show her all the icons, both those that were hanging on the walls, as well as those that were laid up in various commodious places. Not one icon was found to be in suitable accordance with the description. Then according to the advice of the church warden and also one church member who happened accidentally to come in, Father Nicholas started to earnestly seek for the icon everywhere: on the belfry, on the staircase, in closets, and, finally, in the basement. And now it was namely here, in the basement, amidst old boards, various cloths and old used utensils, in the dust, that the large, narrow, ancient black icon upon which at first nothing could be distinguished – was found. 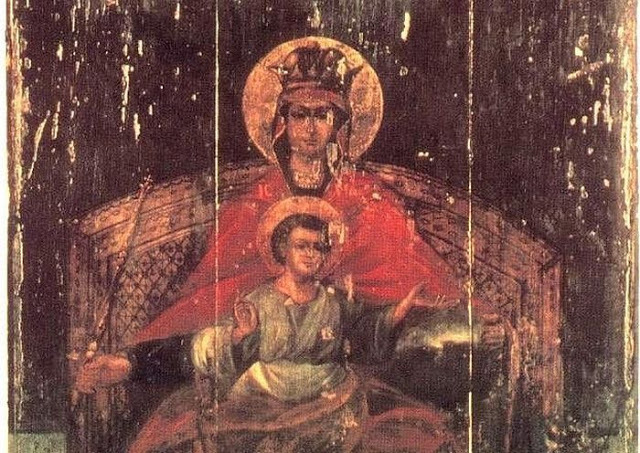 But when this “black” icon was carefully wiped off and washed off the dust and soot that had accumulated in the course of many years, – here to all present appeared the image of the Mother of God, sitting as a Queen on a throne, with a crown upon her head. Evdokia Andrianova immediately clearly recalled and recognized her last dream vision, fell face downwards, and with tears began to ask to serve a moleben service (a supplication service) of gratification with an akathist to the Mother of God (this was a general akathist hymn to the Mother of God). Father Nicholas immediately fulfilled her request. The news of the revelation of the new icon on the day of the Tsar abdication of the Throne, on March 2, 1917 – quickly spread through the neighboring vicinities, penetrating into Moscow, and started to spread throughout all of Russia. A huge number of pilgrims started to accumulate in the village of Kolomskoye, and before the icon miracles of healing of both physical and mental infirmities were manifested, according to the witness of those had received this help. They started to carry about the icon in the neighboring churches, factories, manufacturing plants, the icon remaining in the Ascension Russian Orthodox Church in Kolomskoye only on Sundays and holidays. I and servant of God Mary came to page homage before this icon namely on Sunday. His recital concluded, Father Nicholas led us into the church. On entering the church I immediately noticed on the right, next to the kliros (right hand choir area), a big (to me it even seemed immense) narrow dark icon. The Heavenly Queen was depicted as the earthly Queen, sitting on a royal throne, in a dark red royal robe with a green lining, a crown upon Her head and with scepter and imperial globe in hand. Upon her lap was the blessing of Christ child. Unusual for the countenance of the Mother of God was stern, severe, and commanding gaze of her sorrowful eyes, filled with tears. With trembling and fear, with prayer for forgiveness, I fell to the ground in homage, and, following three prostration’s, I kissed the holy icon. For a long time, silently, with concentration, attentively, heart tensed with bitter tears of repentance and sweet tears of tenderness of feeling and gratefulness, I looked at the wondrous icon which was gracefully bedewed with the spiritual fragrance and with a fine physical odor of rose oil. Following several weeks I again had occasions to be in the village of Kolomskoye, and I was profoundly shaken by the alteration in the appearance of the icon: by itself it had undergone a miraculous renewal, she had become bright, clear and … “red”, since it was with especial striking that the royal robe now impressed itself upon one’s vision, as if it were soaked with blood. Knowing the exclusive strength of faith and prayer of Tsar Nicholas II and His particularly reverent honoring of the Mother of God (let us recall the Sobor-Church of the Theodore icon of the Mother of God in the Tsarskoye Selo), – we may not doubt that it was he who succeeded through prayer in having the Mother of God take upon Herself the Supreme Royal authority over the people, who renounced their Tsar Anointed one. And the Mother of God came into the “Home of the Virgin Mother of God” that had been prepared for Her by the whole of Russian history, in the most difficult moments of life of the God chosen people, in the moment of its greatest fall, and took upon Herself the succession of authority of the Russian empire, when the idea itself of the Orthodox Supreme National Tsardom had been trampled in favor of satanic tyranny. It is for this reason that the gaze of Her wondrous eyes, filled with tears of Divine wrath and maternal love, are so stern, severe and filled with such sorrow: it is for this reason that Her royal robe is soaked with Russian martyr blood and the jewel tears of innocent Russian martyrs decorate Her crown. The symbolic meaning of this holy icon is clear for spiritual eyes: through uncountable suffering, blood and tears, after repentance, the Russian people would be forgiven and the Supreme power, preserved by the Heavenly Queen Herself, would without any doubt be returned to Russia. Otherwise why should the most holy Mother of God preserve this power. 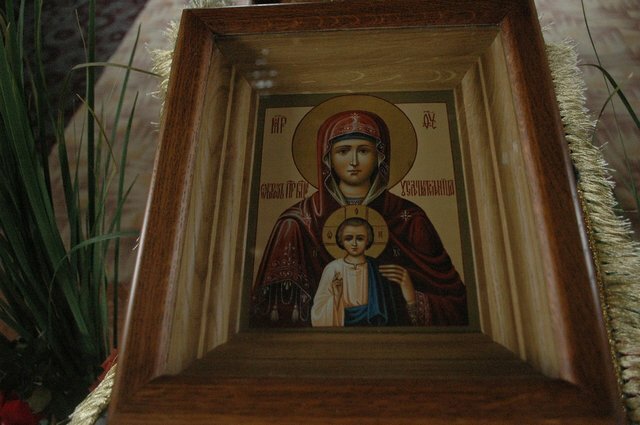 With joyful fear and repentant trepidation the Russian people began to pray before the “Reigning” icon of the Mother of God throughout Russia, and the icon itself, in innumerable reproductions, started to embellish all the Russian churches. A marvelous akathist and canon dedicated to this holy icon appeared, listening to which the whole church was to fall upon its knees. (Editors notes: The New Martyr And Confessor Patriarch Tikhon [1917-1925] wrote this akathist to the “Reigning” icon of the Mother of God. St. Tikhon was the Patriarch of Moscow and All Russia at the time. This Venerable Patriarch said this Akathist frequently).) Several years passed and then the most cruel persecution set in upon the heads of the pious reveres of this holy icon, who prayed before its copies throughout all of Russia.